ollowing the Orlando, Florida, shootings in June, IU Police Department Deputy Chief Doug Johnson called members of the IU LGBT and Muslim communities to check in with them. The goal is to ensure all students are comfortable sharing information and interacting with the IUPD, Johnson said. 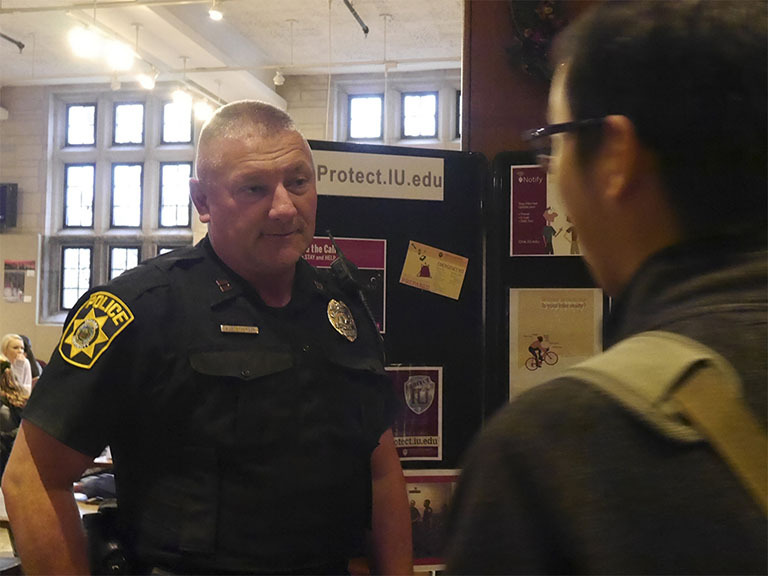 While international and minority students may not have full-time IUPD liaison officers assigned to their communities, they have an entire police force dedicated to their safety. Rendy Schrader, Office of International Services director of student and scholar advising, and Johnson said the greatest challenge with international students is cultural differences, which require students to be taught about Indiana laws and customs and for officers to be trained to be sensitive to other cultures. In some countries, Johnson said, the public’s relationship to police is more strained than in the United States. In some places, people leave doors unlocked and don’t worry about theft. In some cultures, an officer showing the bottom of his shoe to a citizen would be highly offensive. To bridge the cultural gap, IUPD has asked the Office of International Services, as well as several minority organizations, to assist in cross-cultural and diversity training for cadets and officers. Schrader said the officers were excited to appear in a three-minute international student safety video, which the OIS said it hopes to release by the end of the week. The video, which Johnson said is being translated into multiple languages, includes clips on safety rights and responsibilities and an introduction to IUPD and Bloomington Police Department. An endowment provided by the family of Yaolin Wang, an IU student who was murdered last fall, funded the video, as well as an international women’s conference and the printing of small cards with information geared toward international students. The cards, which were handed out at orientation events and continue to be distributed around campus by OIS, resulted from the work of what Schrader called a dream team. Laury Flint of IUPD, Tracy James of Public Safety and Institutional Assurance, Stacee Williams of Student Legal Services and Angela Adams of the Office of the Vice President and General Counsel each contacted Schrader individually about serving the international student community, and they formed an initiative from their common goal. In a further effort to promote a positive relationship with international students, IUPD officers attended international student orientation events and handed out water bottles in the OIS lobby. James and Flint are also working to strengthen department relations with the new leadership at the Neal-Marshall Black Culture Center to better understand concerns such as microagressions, Johnson said. “That’s incredibly valuable for us because that’s our opportunity to learn what’s on the mind of not just that particular community within the University, but a line of thought that we don’t know until we know,” Johnson said. Johnson said the dialogue resulting from of his June phone calls spurred an initiative led by Sgt. Nick Luce and a group of female Muslim students. The initiative will train officers on social and justice issues as they pertain to Muslim women. More broadly, James said she has been working to develop a Public Safety Partnership program, which aims to improve the student-police relationship by bringing a diverse group of students together with public safety officials.